General Manager of Madame Tussauds Beijing Wang Rui said she was honored to have three Jackson figures at the venue. She also shared a lovely story with fans, saying "When Michael visited one of the Madame Tussauds in 1998, he fell in love with the clothes on his wax figure made by our designers. He immediately took off his own clothes, and exchanged them with the ones on the wax figure. The next day, he wore the wax figure's clothes and went out." There are 19 Michael Jackson wax figures in 20 venues around the world, , Wang said, second in number only to Queen Elizabeth II, which indicates how much the people of the world love Michael Jackson. She noted that the day also marked the 30th anniversary of the charity song "We Are The World," written by Jackson and Lionel Richie and recorded along with more than 40 American superstars. Normally every Madame Tussauds venue exhibits one Jackson figure. The trinity special exhibition tour is rare and will only stay in the Beijing Madame Tussauds for three months. Madame Tussauds Beijing branch, owned by Merlin Entertainments Group, opened in May 2014 on Qianmen Street, a landmark pedestrian street near Tiananmen Square. The Beijing attraction is the fourth Madame Tussauds in China. The previous three are located in Hong Kong, Shanghai and Wuhan. 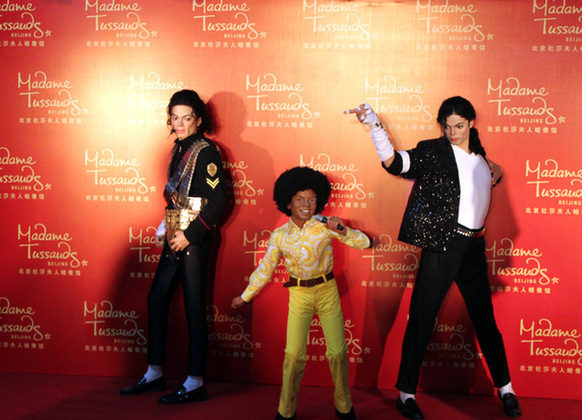 Singer Jason Zhang unveiled three Michael Jackson wax figures in the Beijing branch of Madame Tussauds on Wednesday.